Friction Stir Spot Welding (FSSW) is a solid-phase welding process for overlap welding of sheets with similar joint designs as in resistance spot welding. It generates individual spots instead of continuous welds. The process is mainly used in the automotive industry, the railway rolling stock manufacture and in aircraft production. For instance the rear doors of the Mazda RX8 and the boot lid of the Toyota Prius are welded by this process in high-volume production. 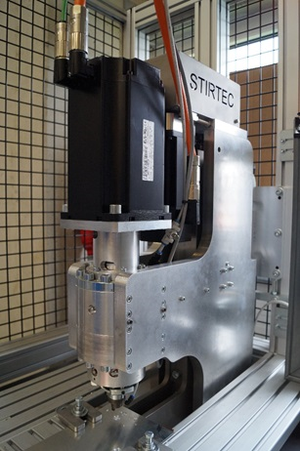 AluStir sells the industrial FSSW Machines of Stirtec in Styria. They are easy to operate by an intuitive human-machine interface (HMI) and their programmle logic Controller (PLC) uses unique close-loop force-displacement algorithms. The machine operatpor sets the parameters such as rotation speed, downward force and plunge depth via a touch screen panel dependend on the workpieces to be welded. The process may be split into several phases, such as plunging and dwelling. FSSW is particularly beneficial for welding aluminium sheets either to aluminium, copper and steel. Similar and dissimilar material combinations are possible. The workpieces do not melt but get only plasticised, because a high forging force is applied similar to that in extrusion presses or forges. The oxides on the workpiece surfaces get disrupted by the rotating tool and are stirred into the Nugget which is compressed by the tool.